On 3rd of September 2015 at IPR I was unfortunately admitted, yes as a patient and was diagnosed with Pleura Tuberculosis on 4th of September 2015 and started on antituberculosis for 6 months. I fully understand that many doctors just like any other human being bear the risk of getting any diseases, including the incurable one. I am very thankful that myself has been infected by this disease which is curable and non-debilitating as much as the other disease may have done. But I wouldn't want this just to be a memory, I need to document this somehow so I would remember how it feels like to be a patient, more over on how much this has an impact on my own self. I have been taking care of the isolation/ tb cubicle for a month, hesitating much at first but I couldn't believe how much I have enjoyed and love the company of my patient, for the first time I actually feels that I am providing a holistic care towards my patient unlike my daily routine of treating the disease itself and having to ignore the social aspect. Mr.C is a mid 40s chinese man who has been on chest tube for 3 weeks by the time I took over his care , unfortunately he may have Lung Cancer which may have spread which means a poor prognosis, never once he complained to me about the pain of the chest tube, he look worried but always cooperative and smiling. 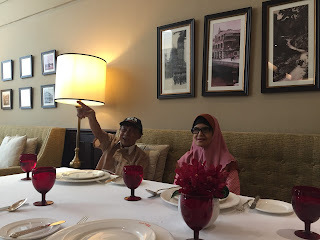 He used to be a contractor -works with tiles and stuff (which I suspect may work with asbestos which may cause the Ca) who has a wonderful wife- 'isteri saya muda lagi, anak saya 5 orang' is what he always told me with tears running down his eyes.... He told me he needs to go back to work to support his family and one day I guess he could not take it anymore he absconded with the chest tube along, and amazingly he survived the 2 hours journey of riding a bus and walking 5 flight of stairs!!! I just go near him and said, 'Saya mahu tolong uncle' and he looked at me with a sad face and alhamdulillah put down his knife, I know he would not hurt us, even more me whom I think has been a good acquaintance of his, or I hope so. Mr.A is a 25 y/o malay gentleman whom his story maybe a lot like me, perfectly well and yet not so well inside. Again having a chest tube inserted more than what has been promised but never once laments about the pain he has to go through. I thought he would lost it as well but fortunately he didn't and pull through! Many other stories that I feel like writing, unexpected diagnosis that crumble their life in just a second, or some that called for the relatives to reach out for them before letting them go for good but it would take me all night to do that. Having a chest tube is definitely a different experience, trust me! With every breath I feel like a sharp knife was being cut to my lungs. And if you are not so lucky like myself, unable to tolerate tramal, having Paracetamol and NSAIDs as your only means of analgesia I just feel like it was the end. And not being able to speak or cry because it will only make the pain worst, even more every movement. I only pray that my fate will not be like my patient, to have other incurable diagnosis or having to keep the chest tube for much longer time period. At that time, I fully understand the pain they have to undergo which I overlooked most of the time. Thankfully I stayed at a first class ward with my sister who have helped me through my stay and them.... if only I could show the picture of our isolation cubicle.... and most of the time with no visitors and nurses who have no enough time to care for them due to the overcrowded of patient. I have learnt more about myself and others, I want to thanked every one who has been wishing me well and taking the time to visit me. To my family, my amazing mom who is 65y/o and E who is 76y/o but still visit me everyday , they hired a taxi and go through all the traffic (30 mins journey could make up to 2 hours journey) ; walked up and down those stairs just to see me.... O Allah how could I repay them, I 'm sorry that I made you worried. I love you and I hope that I can take care of you both just as how you did to me. To my sister, no matter what happened, at the end I know you will have my back always. Thank you for putting aside whatever feelings that was there at that time. For caring for me like I am a baby :) I love you no matter what , i hope you understand that. See, knowing you are around made me less nervous and scared, thank you for being there and always checking up on me. I definitely owe you two a big meal! To all my colleagues in this field, please take good care of yourself, take the necessary precautions and work hard but enjoy your life too please! Call me up for some catching up! I'll be free :) or just wait for my calls, this definitely teach me not to wait for later but treasure the now!